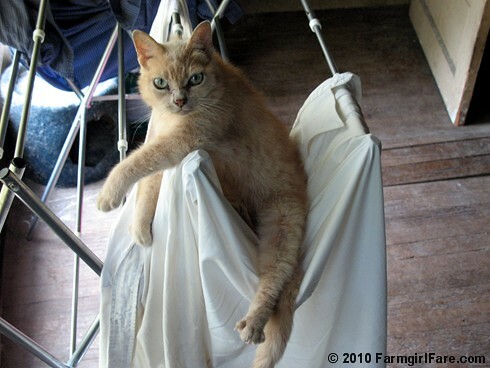 Farmgirl Fare: Tuesday Dose of Cute: What? You've never seen someone hanging on a drying rack before? Yes, our living room is decorated with dirty clothes. And vet supplies. And two vats of brewing beer. But we have an excuse; we live on a farm in a falling down shack. I mean, look at that bump in the hardwood floor. It runs across the entire room, getting bigger as it goes, like there's a big sea serpent living down in the crawl space or something. Interior design simply can't be high on the list. Besides, we almost never let people inside. Seriously. We also have various cats scattered around The Shack, and four pound Molly Doodlebug (aka The Doodle Monster), who pretty much despises everyone but me, has been hanging out in some very odd places lately in an attempt to beat the heat (or just be weird). Because she's so tiny, she can venture into and onto places that no normal cat has ever gone before—you know, like on the tops of doors. It came as no surprise to either of us then to find her napping on the top tier of the laundry rack, somehow balanced on one of my dirty work shirts. When Joe walked through the back door, which is right next to the rack, I whispered, "Look at Doodle," and pointed to her. It took him about 10 seconds to figure out where I was actually pointing, because even Doodle cats do not normally hang from laundry racks. It's become her favorite place to be right now, and I've seen her in at least a dozen different precarious positions, every one hilarious. Yesterday afternoon she had her back paws balanced on one of the lower bars and her front paws were hanging over a top one, like a gymnast. Right before I snapped this photo, she was curled up in my shirt like it was a hammock. Joe wondered if she was working on her circus act. I said I hoped she wasn't planning to run away and join one. She really has become quite the acrobat, especially for a 15 year old cat. You never know with Doodle, though. In December 2008 she was diagnosed with mouth cancer, and the vet gave her just a few months to live. But a year and a half (and lots of soft foods) later, he can't believe how well she's still doing and says her story is one for the vet journals! Want to see more of my beloved little monster? © FarmgirlFare.com, the death-defying foodie farm blog where my foodie mom isn't going to believe that I actually posted a photo taken inside The Shack. Or that I mentioned the sea serpent living under the floor. She's a cutie. I get a chuckle everyday out of one of ours. Cats...make the world go round. The Doodle Monster is a hoot! And she is also very cute. I have had cats and drying racks but never one do that. Too funny! As for living rooms, we turned ours into an office ages ago. My art studio is in my kitchen dining area...we like to live in our house and I suspect you do, too! Whatever works. In the winter you will find the drying rack in the bathtub most of the time and a Shaker drying rack over a heat vent for drying gloves, hats and scarves. i am glad to hear you talk about real life in a real house! when i look around the blogosphere i'm struck by how pretty everything is. and then when i want to take a picture of something i'm cooking, or whatever, i'm always trying to crop out the messy or ugly bits. like right now--i have a great big 4 x 8 foot island in the kitchen. which would like great in a kitchen photo shoot--except for the fact that it's covered in a sea of tomatoes--all colors sizes stages of ripeness, or rottenness depending on the day! but meh whatever! we've got our hands full farmgirl and it's a fun way to be. show us the seams along with the cuties we can handle it! She is 15? Good for her - still able to get around, get on to of top and into so many things. I know exactly what you mean. Our house isn't falling down, it isn't finished. We have gone through a hurricane and numerous storms, in a shell home with no inside walls. Life is an adventure I don't have to tell you that. I don't have cats at the moment because I have dogs who think cats are interlopers bent on stealing their people. But I have walked into the house only to find a dog asleep on the table or bar. Makes you wonder how many times they were up there when you didn't find them. Love the Doodle. So happy she is doing well !!! I think of her often. Even if you don't let people in your house, I'm glad you talk about it! This blog makes my day. I look forward to reading more. p.s. I also just discovered your post in 2007 about freezing Zuchinni. I REALLY needed that! So, thanks! Haha!! Thats so cute! Cats are so hilarious! I think that look on her face says it all. "Let me sleep". Cats. You gota love em. It's been a looonnnnggg day and that was just what I needed for a smile! Great shot! As one who HAS been dans le shack, I can attest to not only the rippling floor but also to the weird hiding habits of the Doodlebug; behind the kitchen sink was a favourite. I am sworn to secrecy regarding the shack's decor but all I can say is, I was never made to feel more at home. And whilst I know the new house will be perfect (and soooooo deserved) I hope it will reflect some of the, shall we say 'character' of the old shack! the doodle monster is my favorite. Love hearing about your cats. Cats can be so funny. I need to get a rack like that, because after the heat and humidity we've had this summer, I dread going anywhere near the hamper. Something about this photo makes me understand the "monster" part of her name. She does look like a cat who would randomly decide to attack appendages (fingers & toes) at random intervals. It also shows just HOW small she is. Wow, that is a tiny cat. Beautiful face, though, which is probably how she gets away with her bursts of violence. That's acroCAT, thank you very much. Molly Doodlebug's face, size and personality remind me so much of the sand cats we saw at Big Cat Rescue in Tampa, FL (google "sand cat big cat rescue" for some awesome video) that I can't help but wonder if she doesn't have a sand cat somewhere in her family tree. What a funny little monkey! Love the drying rack! I definitely need one of those for my apartment.